Serious motor vehicle wrecks, often present with serious physical injuries that have there pathology outside the head. Thus, in any case with severe TBI (even without other physical injuries) there can be muscular and peripheral evidence of the injury. There may be some other neurological problems in addition to the other problems they may face. This is true of Ian. 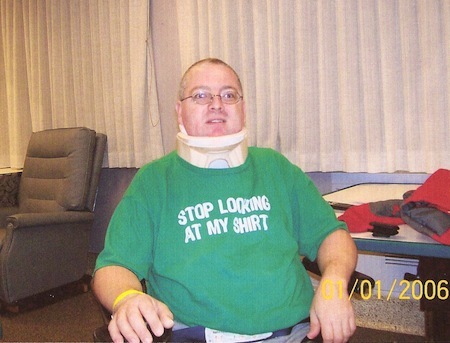 Ian faces neurological problems along with other physical problems due to his injuries. We asked him whether he was able to go back to being a mechanic with his problems including neurological problems? I wanted to. In the worst way I would love to, but physically-wise and strength-wise and everything, I just couldn’t do it. I’m right-handed. I find myself doing more things with my left hand than with my right. Like say, if I play a dice game, especially with my kid, I used to shake dice with the right hand all the time. Now, I do it more with my left hand. I could probably do, but I don’t. I still try to do it with my right hand. Does your signature look anything like it used to? It’s close, but I know it’ll never be exactly the same. But it’s pretty close to what it used to be. Is the biggest problem with your right side more fatigue than it is lack of coordination? Yeah, I would say – well, in that area, it kind of balances between fatigue and coordination. Some things I can do no problem at all, and other things I just find myself basically stumbling over myself. Like say, you walk on a balance beam; most people couldn’t walk on a balance beam. I, I used to be able to do that. Now if I do that, if I don’t look down to see what I’m doing, I’m going over. Well, when you worked with forklifts and in some cases they’re some applications you’re up in the air. You’re on a skinny little thing you have to maneuver across, and let me tell you, you have to balance. Is the problem with your balance is because your right side is weaker, or is it because you have neurological problems inside your head? I would say it’s in my head, basically. I do find myself getting somewhat dizzier than I used to, and maybe a touch of the vertigo part; not real bad like some people have. But I get to a point where I feel like I get real, like I’m spun – like somebody’s spinning me around and it’s like wait a minute. I could stand on one foot, but for how long I don’t know. Whenever I need to go someplace, I go. So there’s no real set limitations. Because of your neurological problems do you find yourself becoming impatient when you’re driving? No really; not impatient so much, it’s more frustrated, especially with the other drivers. The ones that don’t use the directionals; lane change for no apparent reason; talking on the cell phone, texting; driving with no lights on (in the dark of course). You know, it’s little things like that that just kind of pop out in mind where they didn’t really bother me before. Now, it seems like they take precedence. When you get frustrated, does that distract you from other things? Depends on if anybody’s with me or not. Nobody with me not so much; anybody who’s with me and if they’re talking to me, then it kind of throws me off on that a little bit. I try to talk my way – with the other person I try to talk to them. I see this idiot. He’s driving without his lights on, you know. Do you have any visual symptoms; blurred vision, double vision, anything like that from your neurological problems? I used to have a problem when I first got out of the hospital and not – that my right eye one minute I couldn’t see anything far away, but everything close I could see. And then another day it was like I could see everything far away, but I couldn’t see nothing close. And it was like, it was almost like my eye was, or my brain was saying, okay, let’s focus on this one day. And the next day, let’s focus on that. And then the other day everything’s back to a normal perspective; like it was a readjustment.